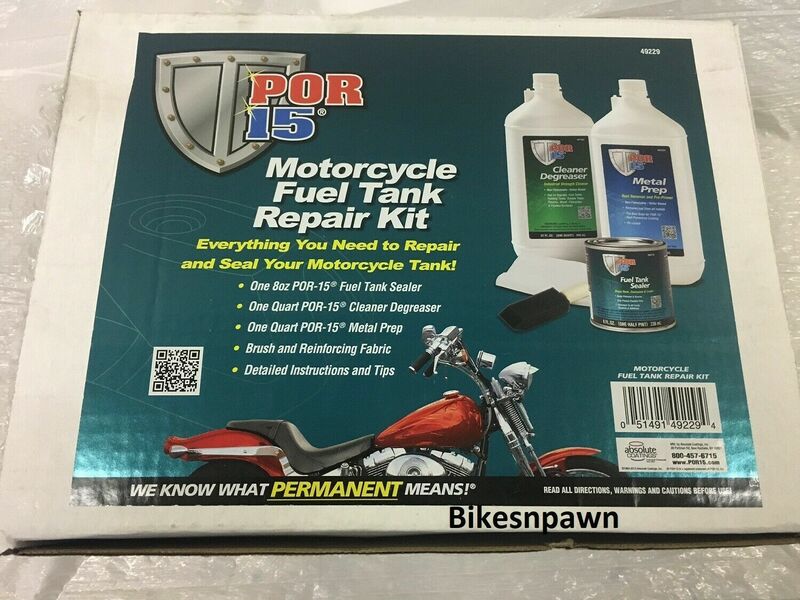 POR-15® Motorcycle Fuel Tank Repair Kit for motorcycles and small metal fuel tanks such as recreation vehicles, snowmobiles, outboards, generators, etc. 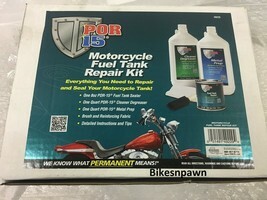 Kit includes 1 Quart POR-15® Cleaner Degreaser, 1 Quart POR-15® Metal Prep Rust Remover and Preprimer, 8 oz POR-15® Fuel Tank Sealer, 1 PowerMesh™ Reinforcing Fabric repair cloth for sealing large holes or reinforcing weak areas, foam brush, and detailed instructions. #P-CTRK. POR-15® Fuel Tank Sealer was developed to stop rust and leaks in metal fuel tanks. Specially-formulated high-tech sealer seals pinholes and seams by chemically bonding to steel and rust, yet remains flexible. Resists all fuel and solvents, even high-alcohol-content fuels. Simply clean tank, pour in fuel neck and slosh around by rotating back and forth, then drain, and air dry. Fuel Tank Sealer creates a permanently sealed tank. CAUTION - Once dry, POR-15® cannot be removed by solvent. To prevent skin from staining, wear protective clothing and avoid contact with skin. If product does contact skin, remove immediately.